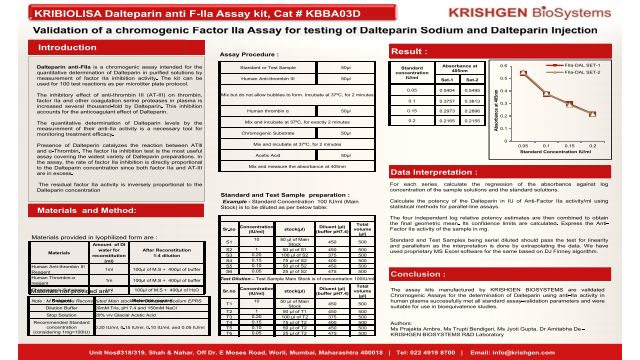 Abstract: Dalteparin anti-FIIa is a chromogenic assay intended for the quantitative determination of Dalteparin in purified solutions by measurement of factor IIa inhibition activity. The kit can be used as per microtiter plate protocol. The inhibitory effect of anti-thrombin III (AT-III) on thrombin, factor IIa and other coagulation serine proteases in plasma is increased several thousand-fold by Dalteparin. This inhibition accounts for the anticoagulant effect of Dalteparin. The quantitative determination of Dalteparin levels by the measurement of their anti-IIa activity is a necessary tool for monitoring treatment efficacy. The kit and its components were used to run samples of biological solutions and plasma to validate and estimate dalteparin sodium. It was concluded that the kits were accurate and sensitive for the estimation of dalteparin sodium and dalteparin injection as per USP guidelines. Summary: Validation of a Chromogenic Assay using Factor IIa for estimation of Dalteprain Sodium and Dalteparin Injection. References: Bioequivalence study of two subcutaneous formulations of dalteparin: randomized, single-dose, two-sequence, two-period, cross-over study in healthy volunteers. C. Gadiko, S. K. Tippabhotla, S. Thota, M. Nakkawar, R. Cheerla, M.R. Betha, and V. Vobalaboina. Journal Drug Assess v.2(1); 2013 PMC4937650.